As a modern and rugged utility knife, the Boker Plus Caracal Folder not only features superior durability but also outstanding ergonomics. The G10 scales are designed with three levels and are seated on solid stainless steel liners, while the positioning of the grooves provides outstanding handling even while changing the grip. 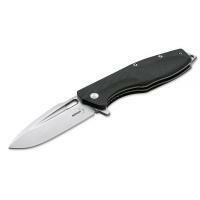 The blade is made from D2, features a stonewash blade finish and has a ball-bearing support for ideal deployment with the flipper. The clip is reversible (l/r) and guarantees a secure seat in the pocket. The liner ends in an impact element with integrated lanyard hole, while its exposed jimping provides additional grip. A modern allrounder for anything life might throw at you.